Uplifting and refreshing, the crisp, vibrant scents of lime and mandarin mingle with sweet basil in this stylish natural reed diffuser. Each of the essential oils in this sparkling combination has its own unique benefits for both the body and mind. Lime is a popular antioxidant and has restorative qualities. Its delightful citrus fragrance is ideal for those feeling a little run down. The aroma of zingy lime is excellent for brightening your mood and can help to restore energy, whilst promoting positivity. Mandarin essential oil is used in aromatherapy for its ability to sedate – but rather than sending you to sleep, it works on the nerves to relax and remove stress, helping to instil a sense of calm. Basil is well known for its uses in the kitchen, but this peppery essential oil has so much more to offer. The spicy fragrance has the ability to reduce anxious feelings and induce calm, while promoting focus and increasing alertness. Warming basil is naturally high in linalool and adds a woody sweet note to the scent. Blended together, this vivid combination of the purest essential oils will help you to create an individual style statement in your home. 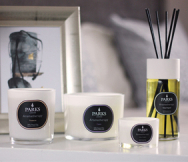 Our diffuser beautifully fragrances the whole room with a lasting aroma, creating a peaceful ambience that you’ll want to come home to. Immaculately wrapped in a stunning luxury presentation box, this gorgeous diffuser would make the perfect gift for a friend or family member. Introduce someone you care about to the Parks range and give them hours of relaxation, a gift that they will truly appreciate.